NBA All-Star Weekend is a showcase for the best and brightest of the basketball world, who come together to put on a three-day show for fans across the globe. Between the Rising Stars game, Skills Challenge, 3-Point Shootout, Dunk Contest and the All-Star Game itself, there's a lot going on -- so much that the casual fan might get lost in all the hoopla. With that in mind, we've provided this handy list of things to keep your eye on this weekend. These should be some of the most exciting moments and storylines of the All-Star festivities, and should at least give you an idea of when to go on your grocery run when the nachos are gone. Coincidence or all part of his master plan? LeBron James not-so-subtly picked a number of players for his All-Star team who will potentially be available this summer through free agency or trade, including Kevin Durant, Kyrie Irving, Kawhi Leonard, Anthony Davis and Klay Thompson. With all the events and availability around All-Star weekend -- not to mention the game itself -- LeBron will have plenty of time to give his best pitch to fellow stars about why joining him on the Lakers is their best option. Players can recruit other players without fear of tampering violations, so LeBron is basically going to be working like a college coach all weekend. So which high-fliers should excite at the 2019 NBA Slam Dunk Contest? And what trend makes one player a must-back? Visit SportsLine right now to get Saturday's NBA Slam Dunk Contest picks, all from the SportsLine expert on a massive 28-10 NBA heater, and find out. Klay Thompson may have usurped the moniker, but Steph and Seth Curry are the original splash brothers. After missing all of last season due to injury, Seth has been a productive member of the Blazers this year and actually leads the NBA in 3-point percentage (.475). His reward is getting to go up against his brother, Steph (who also happens to be the best 3-point shooter of all time), in Saturday's 3-point Contest in their hometown of Charlotte. Knowing the Curry family, the event is sure to contain lots of trash talk and joking ... and a likely guest appearance from their father, Hornets legend Dell Curry. If Seth and Steph can make it to the finals against each other, it could be the most memorable moment of the entire weekend. Dwyane Wade has announced his plans to retire after this season, and Dirk Nowitzki, while he hasn't yet made an official announcement, is also expected to hang up his size 15s. In a gracious gesture, the NBA has allowed both Wade and Nowitzki to play in this year's All-Star Game, with Wade being drafted to Team LeBron (of course) and Dirk suiting up for Team Giannis, as well as participating in Saturday's 3-point Contest. They probably won't play much, but it will certainly be emotional when two players who have combined for nearly 30 All-Star game appearances take center stage one last time. Who wins the NBA All-Star Weekend 3-Point Shootout? And what is the x-factor that puts him over the top? 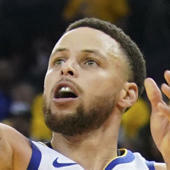 Visit SportsLine now to get Mike Barner's pick for the NBA 3-Point Shootout, all from the NBA expert hitting on an astonishing 74 percent of his NBA picks, and find out. If you're outside of the Dallas area and don't get a chance to watch many Mavericks games, now is your chance to catch one of the most impressive rookies the NBA has ever seen. After narrowly missing an All-Star selection, Luka Doncic will compete in Friday's Rising Stars game as a member of the World team, as well as Saturday's Skills Challenge. Doncic has produced jaw-dropping highlights on a near-nightly basis this season, and he'll probably have some tricks up his sleeve for the exhibition alongside the best young players in the league. Luka is a must-watch whenever he's on the court, so this will be a great opportunity to see just how special he is. A mountain of a man who looks like he's never lifted a weight or run a wind sprint in his life, one-of-a-kind star Nikola Jokic has put together a breakout season as a point-center for the Nuggets, who have surprised the NBA world by producing one of the best records in a loaded Western Conference. Jokic's skill set -- dribbling, shooting, and particularly passing -- is entirely unique and a sight to behold, and you'll get a chance to take a look at him in both Saturday's Skills Challenge and Sunday's All-Star Game. Who wins the 2019 NBA All-Star Game? And what critical X-factor determines the spread winner? Visit SportsLine right now to see which side is a must-back Sunday, all from the SportsLine expert on a massive 29-13 NBA run. New uniform. Same ridiculous hops. Now a member of the Knicks, Dennis Smith Jr. threw down some of the nastiest dunks of the entire contest as a member of the Mavericks last year. He controversially didn't advance to the finals, but his reverse 360 between-the-legs dunk was probably the most impressive finish of the entire night. He's had a year to plot his revenge, so you better believe Smith is going to bring something exciting during Saturday night's dunk contest.